Notley said that the system "may not be our best road forward." MONTREAL — A federal cap-and-trade system to reduce greenhouse gas emissions may not be suitable for Alberta, the province's NDP premier said Monday, one day after her federal counterpart proposed such a plan on the campaign trail. She added that Alberta — whose economy is heavily dependent on the greenhouse gas-intensive oilsands — must get its act together to reduce emissions or risk having a "solution imposed on us'' by the federal government and international resource markets. On Sunday, NDP Leader Tom Mulcair proposed a national carbon trading system to combat man-made greenhouse gas emissions, which are considered by an overwhelming number of international scientists as the leading cause of climate change. He said provinces would be allowed to opt out of a national scheme if their efforts are as good as or better, but didn't provide details. "We're not going to replace something that's working,'' Mulcair said. Notley said her province "may address climate change using different tools than Ontario and Quebec will use,'' referring to a deal between those provinces to work together to cut emissions with a cap-and-trade system. While Notley didn't provide specific targets or details about her strategy, she said Alberta will move away from coal-fired plants — which she said account for 55 per cent of the province's electricity supply — and look into renewable energy, energy efficiency and some form of carbon pricing. "We will be looking for a strategy to phase out the use of coal as quickly as we reasonably can,'' she said, adding she will "phase in change prudently, as our economy recovers,'' in recognition of the fact Alberta is likely to run at least a $5-billion deficit this year because of a drastic drop in oil prices. But Notley said she recognizes her province needs to change the way it is perceived nationally and internationally regarding the fight against climate change — and soon. 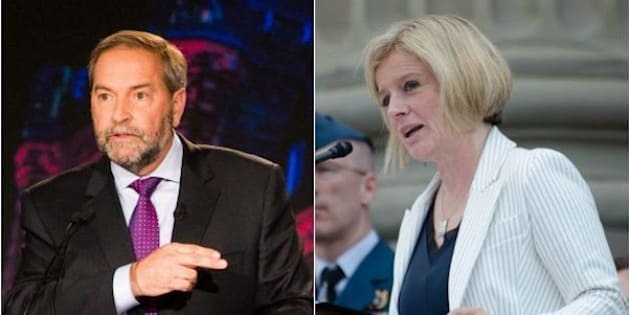 Alberta's opposition party, Wildrose, decried the fact Notley didn't specifically mention major resource projects involving the oilsands, such as TransCanada's Energy East pipeline, which the company wants to build to move crude from Alberta through Ontario and Quebec to be shipped overseas. "Working to promote Alberta is critical, and today would have been a great time to talk about the importance of Energy East to our economy here at home, and across Canada,'' Wildrose Leader Brian Jean said in a statement. Energy East is a politically sensitive issue across Canada, particularly in Quebec, where opposition to the project is strong. Notley took no questions after her speech.